Feel free to follow favy! Inarizushi is a Japanese snack made by filling a fried tofu skin with sushi rice. It has been eaten by common-folk since the Edo period, when it was popular as a street food thanks to its easy-to-eat form. Inari sushi is still eaten as a quick grab-and-go snack, and can also be found at many sushi restaurants or in bento boxes to be munched on at lunchtime. Is it vegan? Gluten free? What's it made of? Standard inari sushi that you will find at most places should be vegan and gluten-free! The outside of inarizushi is made by deep-frying a special type of tofu. The fried product is then soaked in a flavoring mixture that includes soy sauce, sugar, and other seasonings. This becomes a pouch that is filled with sushi rice (rice + vinegar). Thus, there are no animal or wheat products used in the production of inarizushi (although meat or seafood is sometimes added to special varieties, but this will be noted). In addition to being vegan and gluten-free friendly, inarizushi is surprisingly healthy. The added protein and nutrients from the tofu outside make it a balanced and nutritious snack. Why is it called "inarizushi?" Inari, the Shinto god of harvests is said to use foxes as his message bearers. That is why, if you visit a shine devoted to Inari, you will find statues of foxes outside of the various prayer spots. It is believed that these messenger foxes enjoy eating fried tofu skin, and hence the name inari sushi was given to this snack. In fact, you will sometimes see people in Japan leaving fried tofu skin or inarizushi as an offering at the alter of Inari shrines. 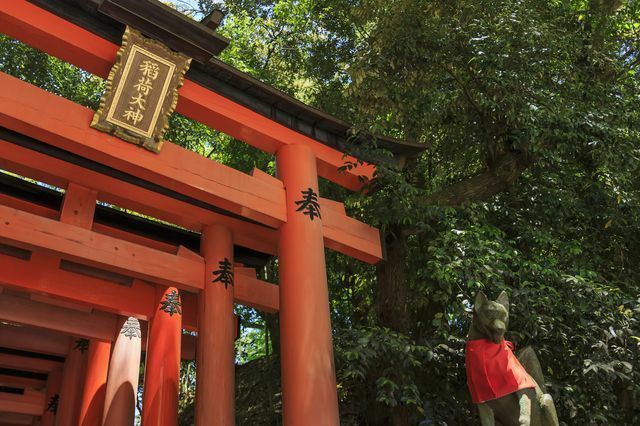 The main, and biggest shrine devoted to Inari is Fushimi-Inari Taisha in Kyoto, famous for its thousands of orange torii. Additionally, the shape of inarizushi will always be either a rectangular (eastern Japan) to represent rice bags offered at Inari shrines, or triangular (western Japan) to represent a fox's ear. Cool! The "zushi" in inarizushi is the exact same word as "sushi." In Japanese, consonant sounds sometimes change when words are made into compounds (inari + sushi = inarizushi). What makes a good inarizushi? It is said that what makes the difference between good sushi and outstanding sushi is the rice. This is also a big factor for inarizushi. Great inarizushi rice will have balanced acidity and sweetness and be the perfect firmness (never mushy). The friedd tofu outside will also have a sweetness and flavor that will be stronger or weaker to balance with the flavor of the rice. A delicious inarizushi should be refreshing and satisfying, and shouldn't make you feel sick of the flavor after a few bites. You will know it when you've enjoyed a good one. Where should I go to try the best inarizushi? If you want to try some truly outstanding inari sushi, head to Ginza Uokatsu. This restaurant serves fancier food at dinner time, but at lunch from Tuesday to Friday, they offer some very special inari sushi. The inari sushi goes on sale starting at 11:30, and is available until it sells out. Check it out! Otsuna Sushi in Roppongi also serves amazing Inari Sushi at lunch time. Get there early to make sure you get some! Izuu is a well-known restaurant specializing in saba sushi that also serves outstanding inarizushi. The inarizushi at Izuu includes various mushrooms in its ingredients, and is very unique (and very delicious). This is a must-try bite in Kyoto. Kanryu is a small sushi restaurant in Osaka that serves unique "koinari," which are small-sized inarizushi. The restaurant itself is reservation only, but you can order just a take-away box of inarizushi for ¥1,100. It might be best to call ahead of time to ensure that you can get a box, however. Must See! Tuna Demolition Show At Maguro Shoten, Shinjuku! I live in west Tokyo and spend my time thinking about food and going bouldering.